The neo-liberal globalisation project, creating multi-billionaires by impoverishing billions was bound to face a backlash of resistance or even revolution sooner or later. The Arab Spring, turbulence in China, you name it – all part of the same phenomenon. The potential for an alternative left agenda to gain traction exists – Syriza, Podemos, Sanders and Corbyn have been hopeful signs – but years of acceptance of neo-liberalism by the social democratic parties and trade union decline have shifted the balance of forces to the right. And now the upsurge of right wing populism in the US and Europe, with its echo of the 1930`s, seems to have a frightening momentum. Yanis Varoufakis said Trump`s victory symbolises the demise of an era and demonstrates that we are at a crossroads when change is inevitable, not just possible; giving the world`s progressives the chance to forge new alliances to press passion and reason back into the service of humanity. The Progessive Alliance proposals by the joint leaders of the Green Party sound as if they may be along the same lines. Certainly things are too serious and dire for people to indulge in compiling lists of red lines, things to be ruled out and people the Green Party could never work with. There is no clear road map for the Green party at this point and there are no short cuts, think tank wheezes or superheroes to make everything nice. So what are the options for the direction of travel ? Firstly, those in GP who hark back to the days of the Ecology Party with its emphasis on “lifestyle choices”. They don`t much like our social justice policy and say that the climate change threat trumps all other issues, which become irrelevant if the planet is trashed beyond repair. That is true but to deliver policies which stand a chance of saving the planet we need mass support which means fighting for a fairer society for all and engaging on the bread and butter issues which concern most people, especially those with no “lifestyle choice” option. To be seen as a single issue party (again) would mean obscurity (again). Secondly, though Green Party members are active in many fields, the main focus of the party itself has been organising to win elections. Success has been steady but modest and at the present rate it is crystal clear that it will be climate crunch time before the party gains any real influence in government. The General Election rout of the Lib Dems led some to hope that the Greens could make big gains at their expense – even replacing the LD`s as the third force in local government. But the LD`s have staged a remarkable comeback as the go to party for diehard Remain voters. Caroline Lucas has described the Green Party as “necessary but not sufficient”, recognising the need for alliances with co-thinkers inside parliament and campaigners outside to generate a social movement. But a Progressive Alliance needs to be more than a one off, at all costs, bid to get a parliamentary majority for a fairer voting system. A fairer system is badly needed but it is far from a key issue for the majority of voters. There isn’t much to celebrate and an urgent need to spread a green left message where thinking globally and locally address the complexities of our world. There aren’t many opportunities as Britain consolidates its position of pariah of Europe and friend of Trump and the Gulf States. The Spring Green conference this year is a start s a conversation as it hosts European and Global greens alongside the GPEW. If you thought that TTIP was dead in the water, while the UK media focused on Brexit and Donald Trump, CETA – the Comprehensive Economic and Trade Agreement, is live and it is not just a dodgy trade agreement between the EU and Canada!. Secret Negotiations on CETA went on from 2009 to 2014. Both TTIP and CETA are regarded as new types of trade agreements. They are not just about reducing tariffs, but are about creating new markets in services by “deregulation” to facilitate trade. This could mean the removal of “barriers to trade” such as environmental regulations, UK food standards, regional trade protections and labour and trade union rights. CETA will mean that oil from tar sands will be more easily imported into the EU, leading to 23% higher Greenhouse gas emissions than average EU fossil fuels. Both the Canadian and UK governments have lobbied for CETA supported by BP & Shell. One of the most contentious parts of CETA is the setting up of a parallel judicial system especially for corporations – the Investor Court System –where corporations can sue governments for profits that haven’t even been made yet. These courts operate in secret and there is no right of appeal. On Feb 15th CETA was approved in the European Parliament by 408 to 254 votes, which means that a large part of CETA will be implemented. What now happens is that each European Parliament will vote on CETA. If it is vetoed there is still a chance to stop this dodgy deal. The House of Commons has not debated CETA so we need to campaign for a parliamentary debate and vote. 2) for fairer democratic trade deals. 3) to have secret courts for corporations scrapped! 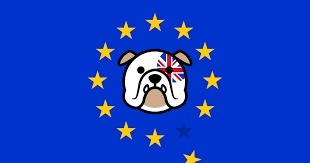 Throughout the referendum, the Leave campaign talked repeatedly about the need to remove EU regulations that allegedly hold back the UK. As the debate descended into little more than internecine Tory grunting, neither side offered any explanation of what EU regulations cover, leaving voters to wonder what they were never mind their merit. And since the vote for Brexit, the Greens’ focus on staying in the Single Market may mean that we lose sight of the need to defend what truly is at risk – and what sort of society we could be looking to build instead. While there is no question that a wide range of employment rights, especially in respect of discrimination, do derive from EU directives and agreements, many more do not but are arguably even more at risk in the gung-ho “entrepreneurial” environment May and her ilk are seeking to craft. While we argue about access to a free trade zone that is in many respects inimical to our long-term aims of localised and sustainable economics, employers’ think tanks are joining with their Tory allies to seek a bonfire not so much of EU regulations but of all employment rights. Their adopted tone however is not the shotgun blast of the past, but rather an insidious, devious range of tactics aimed to divide employees and play people off against each other. The “choices approach” where employers offer staff a menu of rights linked to their performance at work – i.e., longer maternity leave for prized workers; varied periods of probation before employment protection is activated, etc – will be formulated to appeal to enough people, initially, to gain some level of acceptance. All this is proclaimed in the name of national competitiveness, when in fact the collective concept of “national” couldn’t be any further from the reality of corporations carving up even more of the cake for themselves. Having in effect destroyed collective trade union rights, they are now finally coming for the rights of individual employees and workers. Yet we are mistaken in seeing the EU as a guarantor of our workplace security. Its’ flagship Acquired Rights Directive (better known in the UK as TUPE) offers little more than a fig-leaf of protection to transferred workers. Similarly, Brussels and the ECJ were nowhere to be seen when the Lib Dem Ministers in the Coalition introduce fee arrangements which have led to an 80% collapse in employment tribunal hearings. The protections we have against unfair dismissal, the right to a written contract, the right to equal pay for work of equal value, the right to paid holidays and to bank holidays, the national minimum wage – all these come from British law, not European. So are Greens making a strategic mistake in putting our energy into remaining in the single market in the belief that it protects workers when, in truth, what workplace protections it does require are ultimately about ensuring no single member can undercut another rather than about the inherent rights of workers? It is about regulated capitalism, not human rights. 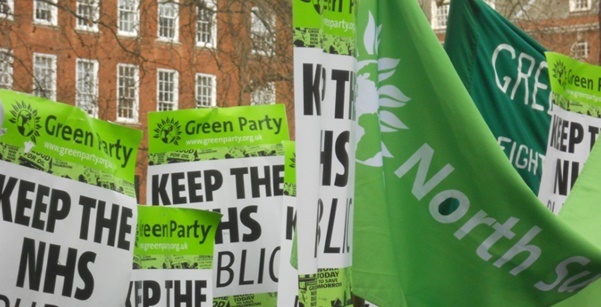 As the EU faces major “populist” challenges to liberalise its economy, in spite of the fact it already largely has been, Greens need to argue for positive rights in the British workplace as these will be squeezed out regardless of our membership status. It is imperative we use this time of change to advocate for the type of economy we want to develop, one which is not dependent on the protection of some distant behemoth of questionable repute, but rather one that rests firmly and deeply in our society and its shared values. Now is the time to be calling for a business environment that gives breaks to co-operatives, community enterprises, employee buyouts and takeovers. Now is when we should be advocating hardest for the living wage AND the citizens’ income (not either or, but both) and even for some level of protectionism as we take key industries into democratic ownership. Corporate law should be transformed to end its cosy legalisation of profit-maximisation as PLCs sole objective to instead a range of duties to employees, communities and the environment. And we must be clear that we are happy to show the door to those who threaten to go – that is real “taking back control”. Alongside this, we should be arguing for a root and branch change to the whole employment relationship. Incredibly, though maybe unsurprisingly, our employment rules still rest on the 18th century Master and Servant laws. While heavily modified over the years, the idea that you are a servant and your employer is your Master remains the central legal concept in the employment relationship. In any democratic society, this is a complete nonsense and it is time to turn it on its head, prefiguring of course a transformation of ownership rights and the control of enterprises. For ecosocialists such as those of us in Green Left, there is also a wider debate to be had as we move towards a world where technology has the capacity to set more and more free from labour and how the abundance in both time and resources is used equitably and sustainably. The day is not far away when, as human labour is less central to material productivity and service delivery, the whole concept of paid employment can be done away with. As we develop that argument, of course, we will be charged with everything from utopian dreaming to economic treason, but as we know, if we don’t map the path for real change, capitalism will do it for us and take our planet in a very different, very hostile and very dark direction. In 2011, the Conservative-Liberal Democrat coalition passed the Parliamentary Constituencies and Voting Reform Act, which specifies that the number of constituencies will be reduced from 650 to 600, each of which must be within 5% of the average electoral quota; except for three island constituencies . The explicit reason was to ‘reduce the cost of politics’ whilst at the same time appointing over 100 unelected new peers into the House of Lords. December 2015 electorate figures, which the Boundary Commission have used as the basis for drawing 600 new parliamentary constituencies, mean seat losses as follows: Wales will lose 11 seats (27.5% of its current entitlement), Scotland 6 seats (10%), Northern Ireland 1 seat (5.55%), North West England 7 seats (9.5%), North East England (14%), West Midlands 5 seats (8.5%), Yorkshire & The Humber 4 seats (7.6%), East Midlands 2 seats (4.5%), East of England 1 seat (1.8%), London 5 seats (7%), South East England 1 seat (1.2%), and South West England 2 seats (3.8%). Metropolitan areas will be hit the hardest in seat loss terms across the UK, as will urban and rural areas north of the Watford Gap. It will also result in many communities being broken up just to fit an unnecessarily tight quota; the Local Government Boundary Commission generally allows deviances from the average of up to 10%. Whereas Latvia’s constitution allows deviances of 10% and Germany’s constitution allows deviances of 15%. Many places will also end up being paired with communities to which they have no ties or usable transport links. It has been estimated by Electoral Calculus (www.electoralcalculus.co.uk) that on current opinion polls the Conservatives will win the next general electionwith a majority of 80 seats; they currently only have a majority of 10. However, if the boundary changes take place that Conservative majority could increase to as high as 100 even with 50 fewer seats to contest. The Green Party will be hit worst of all by these boundary changes. If Brighton is carved up, our only MP Caroline Lucas could be left without a seat. If Brighton Pavilion is succeeded by Brighton North it will become a tight three-way marginal and notionally Conservative, with two strong Green wards joined to Labour-held Hove to become Brighton Central & Hove. This could result in Conservative dominance, stalling of electoral reforms, exclusion of parties other than Conservative and Labour from the House of Commons leaving the electorate even less represented. Having an approximately equal number of electors in each constituency, is not sufficient to address the true inequalities in Britain’s electoral system fundamentally caused by the use of first past the post and safe seats. FPTP always produces disproportionate results irrespective of how equal the divisions are. Proportional representation in multi-member constituencies, as well as abolishing the requirements for candidates to pay to stand in an election, (deposits are not effective at deterring frivolous candidates anyway), are what is needed to make British elections, of all types, truly free and fair. 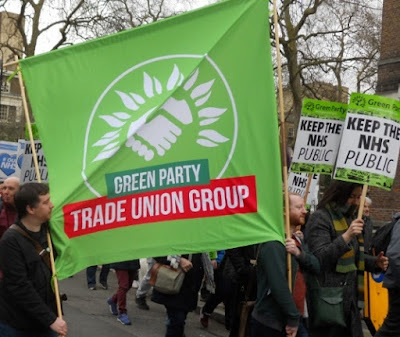 The Green Party Trade Union Group (GPTU) put forward a motion at the last Green Party conference called “Statutory right of access to workplaces for Trade Unions.” This is a policy that calls for Trade Unions to legally be able to access workplaces and recruit members. We are delighted to say that this motion along with Opposition to the Conservatives Trade Union Act passed unanimously so these are now both Green Party policy. GPTU members also ran a stall at the Trade Union Congress in Brighton, in particular promoting these policies. As a group we networked well with fellow Trade Unionists, had a fair bit of interest on our stall and of course got to meet the General Secretary of the TUC, Frances O’Grady who praised Caroline Lucas a lot for her support for Trade Unions, in particular her support for Southern Rail workers. The Green Party co-leader Jonathan Bartley came down and spoke at a really interesting Fringe with MPs from other parties about the need for Proportional Representation. The one negative of the Congress was that there was a Climate Change motion calling for the TUC to support a transition into sustainable jobs failing to pass largely due to certain Trade Unions concerns about protecting their members’ jobs in industries that are not sustainable. 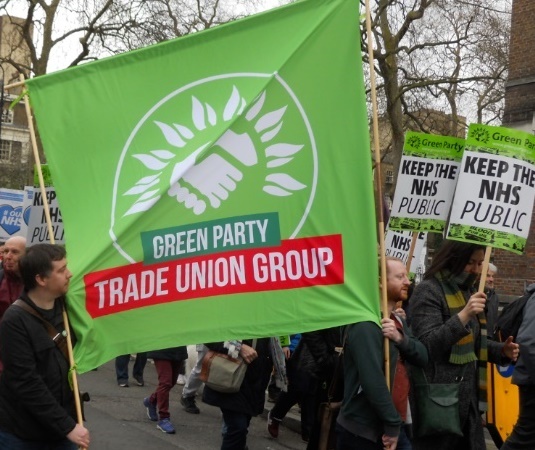 This is why we feel it is more important than ever for the Green Party to continue working with Trade Unions to make sure we have a labour movement that recognises the need to combat Climate Change and transition into new sustainable industries. As well as the TUC Congress, we ran a campaign for "Young Workers Month" with Young Workers sharing pictures with us stating how important their Trade Union was. We even got an article in the Huffington Post launching the campaign and putting the argument forward about why young workers, who are for the most part, in precarious conditions, need to be unionised. Despite the uncertainty surrounding Brexit and the Tories continuing their vindictive policies towards workers, there have been victories for the Trade Union movement. Deliveroo workers independently threatened to go on strike and won fairer pay. The Unite union help Sports Direct workers improve their conditions. The RMT union made sure that 60% of station staff cut by TFL were reinstated after several strike action days. The RMT also are continuing to fight for safely run trains on Southern rail by opposing their plan to have driver only trains. Lastly Picturehouse cinema staff at four cinemas are on strike until they get Trade union recognition and a living wage. After action was taken in 2014, Ritzy cinema staff won a 26% increase in their wage and the BECTU union are hoping current strike action will result in at least a living wage. The Green Party Trade Union Group joins BECTU's call for everyone to boycott Picturehouse and Cineworld cinemas in solidarity with staff on strike. We hope that these stories have inspired you and urge you to get involved with a Trade Union and/or the Green Party Trade Group. We have a stall at the Green Party Spring Conference so come say hello and sign up with us so you can do your bit to stand up for workers rights and social justice when it's needed now more than ever or contact . secretary@gptu.greenparty.org.uk. "The Green Party is a party of social and environmental justice, which supports a radical transformation of society for the benefit of all, and for the planet as a whole. We understand that the threats to economic, social and environmental wellbeing are part of the same problem, and recognise that solving one of these crises cannot be achieved without solving the others "
The above is the first of the Green Party's core values, which inform our politics, and encapsulates all of the others. The commitment to a radical transformation of society for the benefit of all, based on social and environmental justice, and truly sustainable economics, should unite us all. The debate about the wisdom or otherwise of seeking to form an electoral alliance, or alliances, with some of our political opponents,with the twin aims of removing this government and bringing in electoral reform, should be recognised for what it is - a debate about strategy and tactic in support of our agenda for radical system change. A desire to create electoral pacts with other parties should not be regarded as a weakening of a commitment to fighting for radical, systemic change. Rather it should be seen as a sensible and pragmatic response to the logjam of our current political system. A commitment to A Progressive Alliance ( or whatever it is best called ) should in no way distract us from campaigning for our radical economic, social and environmental agenda. The battle against climate change is at a crucial juncture, in the UK and across the planet. Similarly campaigns against air pollution and welfare ' reform' need to be prioritised and further developed along with our exposition of a new economic model. It is a model which challenges conventional notions of prosperity and growth and offers genuine economic security , based on an offer of rewarding employment underpinned by a commitment to a Basic Income for all. We must not be afraid to tell the truth to voters, including hard ones such as the need for everyone to drive and fly less, to eat less meat and reject consumerism. They are truths that we can and should tell as part of an electoral alliance with other parties, who share at least some of our progressive politics. We should be trying to create an alliance of voters, to build a progressive majority in opposition to the Tories and UKIP. In doing so we should be trying to convince such progressive voters to support more of our radical agenda, with the aim of making the Green Party and larger and more influential part of this progressive coalition. "Electoral politics is not the only way to achieve change in society, and we will use a variety of methods, including lifestyle changes, to help effect progress, providing those methods do not conflict with our other core principles "
An electoral politics based on an alliance with other parties to remove this government and introduce electoral reform can and should be combined with a campaigning politics in favour of radical and systemic change. The two are both necessary and compatible. Sustainability and Transformation Plans (STPs) are local NHS and care services plans being set up in 44 areas in England,. Public consultations on the local plans are now taking place. Euphemistically about ‘integrated care’ they conceal £22bn worth of cuts by 2020. The goal is more privatisation, transforming our National Health Service into a two tier model, opening the door to top-up payments for affluent patients, with a minimal basic service for those unable to pay. This winter NHS Crisis headlines appeared almost daily with reports on A & E crises. These problems get media attention, but no clear explanation of their root causes - chronic underfunding and the privatisation political agenda. Immigrants and ‘bed-blocking’ elderly are scapegoated, whilst Ministers will not accept responsibility and. mainstream media fail to hold them to account. Our NHS is saddled with a millstone of PFI (Private Finance Initiative) debt, thanks to the Blair governments. The origins of the NHS crisis can be traced back to the 1980’s, with policies of outsourcing cleaning, catering, laundry and other services. Another big step was the 1990 Act, increasing competition based on the belief this would reduce costs, instead marketisation just escalated costs and private profits. New Labour in 1997 promised limited NHS markets, but then reneged. Funding was increased, but the introduction of public – private partnerships and PFI was a financial disaster. More than 100 hospitals were built, run by facilities management companies. This allows wealth extraction from taxpayers amounts to £2m in one local Trust* . The PFI debt, including schools, totals £300bn in the UK. This is four times the budget deficit used to justify austerity policies. The Health and Social Act (2012) devolved government responsibility to local Clinical Commissioning Groups (CCG’s) and undermined the ability to provide a comprehensive service. The Act opened the NHS to unlimited privatisation. Significant sectors of the NHS were outsourced to private companies like Virgin and Serco, able to cherry-pick, with no interest in acute services, intensive care, transplants, accident and emergency and children’s medical care. Meanwhile, pharmaceutical firms are overcharging the NHS by striking non-compete deals, and mental health services are underfunded and losing beds. The 2015 Tory government has consolidated the privatisation of the NHS. The Junior Doctors contract dispute was a blatant attack on pay and conditions. Student nurses’ bursaries have been axed. The Chief Executive of NHS England, Simon Stevens, was with United Health in the USA and lobbied against Obamacare. Too many top NHS managers are on grossly excessive salaries. The NHS Five Year plan is an attempt to copy US health care. The Sustainability and Transformation Plans (STPs) will see thousands of beds slashed, the closure of A&E departments and maternity and stroke services. The restructuring that may emerge is about creating new models, with chains of super-hospitals and GP surgery networks. The likes of Virgin and Serco want profitable Chains. STPs must be challenged by NHS workers, trades unions, patients, carers, local authorities and everyone concerned about the attack on our NHS and its founding principles as laid down by Bevan. Local STP documents for the public consultations are often attempts to disguise cuts to services and inadequate resources with optimistic talk of integrated services, centres of excellence, merged services, and single points of access for urgent care. The STP discussion paper for Bedfordshire, Luton and Milton Keynes, refers to a funding rise of 26% by 2020/21, but admits this will be fully absorbed by rising demand for services, leading to an annual shortfall of £311m. However sceptical we may be that the local consultations are merely tick-box exercises, it is important that this opportunity is taken to probe and question the plans. * The largest PFI scheme in the UK is the Royal London Hospital and Barts, in Tower Hamlets, where I worked for almost 20 years, run by the Skanska Innisfree consortium. The spectre of Windscale will haunt Cumbria long after the Copeland by-election is forgotten. Decommissioning the reactors will take at least 100 years to complete. The Green Party can be proud that by-election candidate Jack Lenox made a principled stand against nuclear power. The UK’s worse nuclear accident occurred on 10 October 1957 at Windscale in Cumbria. Originally called Calder Hall, now Sellafield, the nuclear reactors were built with one purpose in mind: Britain’s nuclear weapons. Publicity around Calder Hall carefully avoided any mention of its primary purpose. The accident happened during a graphite moderator annealing process known as ‘Wigner release’. The reactor core caught fire. By the next day 11 tons of uranium was on fire. The fire lasted for three days, with the release of radioactive Iodine-131 and other radionuclides over the UK and Europe. Milk was contaminated. There were an estimated 240 additional cases of thyroid cancer.The radiation release could have been far worse had not chimney filters been fitted, almost as an afterthought. No more air-cooled reactors have been built. THE CLIMATE CHANGE MOTION TO THE TUC IS NOT DEAD! People from a variety of Green and/or Left political organisations and traditions are now engaged in launching an Ecosocialist Network, intended to include Ecosocialists, from various political parties or none. There is a political opening for Ecosocialists to get organised, and indeed an urgent need to make this happen. 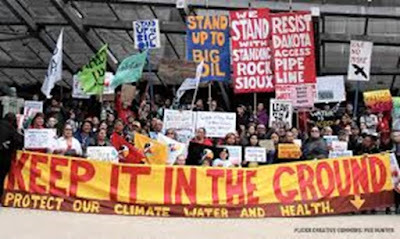 We live in turbulent times politically, underlying this there is economic turmoil and it is becoming increasingly clear that this is related to a human-caused ecological crisis shown by the chaotic consequences of accelerating climate change. 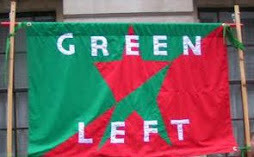 Many people in different ways have recognised this and are attempting to deal with it; through pressure groups, campaigns, political parties and individual actions, A unifying factor is the perception that any useful attempt at a solution has to involve a reorganisation away from capitalist economics and politics. An Ecosocialist network could provide a forum for planning the necessary change. And sometimes squished into dog poo. Like the hurled workers’ clogs.